I cannot say enough wonderful things about wild mushrooms. Although you’ll often see them categorized as a vegetable, they technically belong to the fungi family. Their medicinal benefits have been recognized by Eastern medicine practitioners for thousands of years. Modern science is now catching up to ancient wisdom as research uncovers the plethora of wild mushroom benefits. Shiitake – This mushroom has potent anti-inflammatory, antiviral and anticancer properties. They are high in copper, B vitamins, selenium, and zinc. Not only that, but they also contain a unique phytonutrient called eritadenine, which can help lower blood pressure and circulating cholesterol. Additionally, shiitake’s high level of beta-glucans, a type of carbohydrate, supports the growth of beneficial bacteria in the gut as it passes through. They taste great in a stir-fry, frittata, soup/stock and many other dishes. As with all mushrooms, shiitake are porous and if exposed to too much water or rinsed too far in advance, they will become soggy. Therefore, the best way to clean mushrooms is to take a damp cloth and gently wipe them right before cooking. Maitake – Also known as “hen of the woods”, maitake mushrooms are high in antioxidants, contain antiviral, anticancer compounds, and have immune modulating properties. Studies also show maitakes have the ability to support healthy blood pressure and blood sugar levels. This mushroom’s texture and flavor is unique. If you dislike mushrooms because of their texture, I encourage you to try this one. Pull the mushroom apart and sauté with some garlic, salt, and pepper then add to chicken broth to enhance the flavor and texture. You may be surprised at how much you love it! Reishi – This mushroom is very bitter and has a woody texture, so it not for cooking. Rather it is used for medicinal purposes only in dried or tincture form. Some studies have shown this mushroom’s chemoprotective effects such as reducing chemo-induced nausea, increasing the effectiveness of radiotherapy, and inhibiting the growth of malignant tumors. You can get this in the form of a tea, liquid extract, or capsules (see below for examples). Chaga – Not unlike the previous mushrooms, chaga has been shown to protect against cancer (especially liver cancer cell growth), enhance the immune system, reduce inflammation, and may even help boost athletic performance. Similar to reishi, chaga can be found in dried, capsule, or liquid form, and is not used in cooking. Cordyceps – Similar to chaga, many people use cordyceps to enhance athletic performance and improve feelings of fatigue. It may also act as an adaptogenic herb to help calm the stress response. Animal studies have shown cordyceps’ ability to increase T-helper cells needed to fight infection. 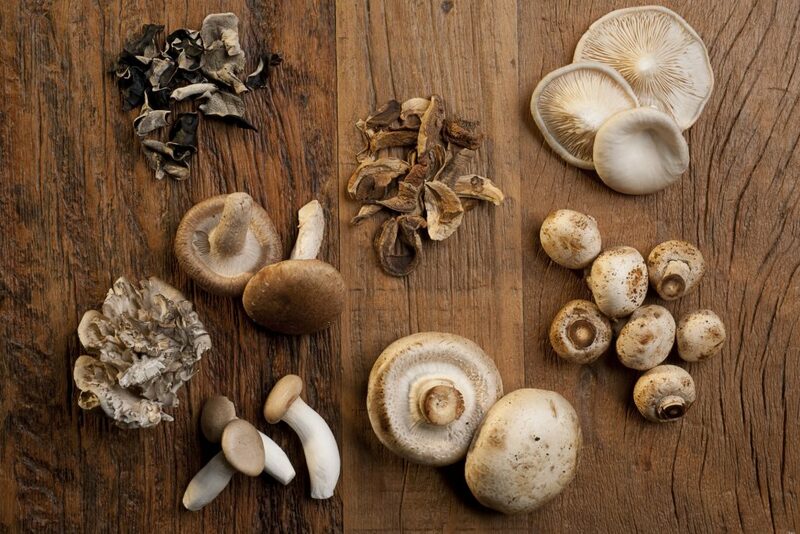 This mushroom is available in whole dried form which you can add to soups, stews, and stocks. You can also purchase it as a liquid extract or capsule. As a nutritionist, I always recommend getting your nutrients from food first whenever possible. While some mushrooms require that you take them in the form of a supplement, it is best to get culinary mushrooms as they have always been used – in cooking! For mushrooms in supplement form, I recommend a company like Host Defense (see below) who incorporates a full range of healthful compounds that are well absorbed. I’ve listed some of our favorite resources to help make it easier to add mushroom goodness to your life. If you are taking medication or being treated for a health condition, it is best to discuss the addition of medicinal mushroom supplements with your medical provider. A Functional Medicine practitioner can help provide safe, tailored supplement recommendations. Four Sigmatic is a company that offers wild mushroom coffees, elixirs, and even tasty hot cacao blends. They believe in the real magic of functional mushrooms to help you live a better, more enhanced life without changing your day to day routines. You can search their products here. Host Defense is a supplement company that offers a wide variety of mushroom concentrates and tinctures. You can search and purchase their supplements directly from their website. Mountain Rose Herbs is an online herbal store that carries dried mushrooms as well as bulk organic herbs, spices, and much more. Type in “mushrooms” in the search engine and scroll through their many options.